Tribal Fusion Belly Dance – Innovation or MishMash? The variety of Tribal belly dance styles is amazing, and seems to be constantly growing - which is surprising in a way, when you consider its history. The original Tribal belly dancing originated in America in the 1960's. Jamila Salimpour, who's credited with originating Tribal belly dance, readily admits that her vision owed as much to the many ethnic influences swirling around at the time, as to the real Middle East. Think of Afghan coats and the hippie trail! Carolena Nericcio of Fat Chance Belly Dance codified the style and turned it into a proper syllabus, American Tribal Style, so it could be replicated authentically by belly dance teachers around the world. So in fact, Tribal belly dance has a more structured foundation than other belly dance styles - which are usually passed on by word of mouth, without any syllabus at all. But although teachers who qualify as ATS instructors are very highly regarded, many Tribal teachers seem to regard other teachers more as “influences” than gurus, and the emphasis is on developing your own "fusion" style, rather than faithfully following the original teaching. But what is tribal fusion? 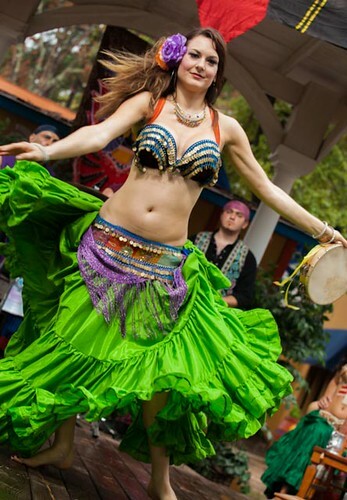 It's Tribal belly dance “fused” with another dance style – and it's been done with a bewildering array of genres, including flamenco, Latino, burlesque, gothic, hula hoop, bollywood, ballet, hip hop, acrobatics and even American cabaret belly dance (tribaret). And some of it is, frankly, awful. Don't get me wrong – done properly, tribal fusion can be fascinating, unique and enriching. But too often, I see Tribal dancers attempting fusion with a dance genre they know nothing about, or using steps they can't do properly. The result is messy, amateurish - and sometimes downright insulting for those trained in the dance they're "fusing". As a former flamenco performer, I often find myself cringing at so-called “flamenco fusion” routines that owe far more to South America than to Spain. And I recall seeing a truly dreadful “ballet fusion” routine by a dancer who clearly harboured dreams of being a ballet dancer in her youth – she could (just about) get up on her toes in her pointe shoes, but someone should've told her that arabesques with bent knees and half-pointed toes are not an authentic look. So before you decide to try a fusion dance, consider this: if a hip hop dancer decided to create a Tribal belly dance routine, and based her choreography on some Tribal performances she saw a few years ago, would you think that was reasonable? If not, then please be sure you accord other dance forms the same respect you'd expect from others, and do your research before you choreograph! How Many Male Tribal Belly Dancers Are There? I concur whole heartedly! Fusion can be fabulous, artful and spellbinding when done well; worse than dreadful when done without knowledge or respect for the styles being fused.